Method Man is a little torn. On Monday night, his hometown New York Jets play host to the Miami Dolphins. What? Why would the hip-hop legend/actor have any interest in the Dolphins? AP Photo/Evan Agostini Method Man worked with Sour Patch Kids on a new music video. "That's because Reggie Bush plays for them," said Method Man, whose real name is Clifford Smith. "He and I are tight when we would hang out at the same barbershop in Los Angeles. He was born the same day as me [March 2]." That's how Method Man rolls. He's friends with everyone. And he loves the NFL. "I played as a kid and now I'm a big football fan," said Method Man, who was born in Hempstead, N.Y., and lives in the city. "You wouldn't believe who my favorite team of all time is, though. It's the Cincinnati Bengals back in the day when they were playing and losing in the Super Bowl. Kenny Anderson, Cris Collinsworth. That was my team." • His partnership with Sour Patch Kids to record and star in the new rap music video for his single "World Gone Sour: The Lost Kids." • His burgeoning movie career, with roles in 2012's "Red Tails" with Cuba Gooding Jr. about the Tuskegee airmen and this fall's "The Sitter" with Jonah Hill. • His U.S. tour, which started last week, to debut his new songs for his upcoming "Crystal Meth" CD. 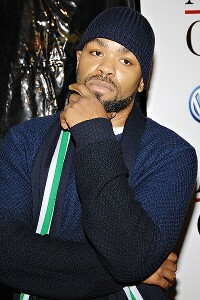 "People like my edge so I've been able to continue to work," said Method Man, who is 40, married and has three children. "I'm not a genius, but I learn to listen. You have to remember that you can't learn anything if you talk too much." And what about the often-rumored sequel to his cult movie hit "How High" with close friend Red Man? "I decided to put my own money in the project and we're working on it now," Method Man said. "I hope to be done filming by next year. Worldwide pimpin', baby."